Chung Sye-kyun, the speaker of South Korea's parliament, on Sunday called on North Korea to resume talks over its nuclear and missile program, saying its nuclear tests were a threat to the Korean Peninsula, the Interfax news agency reported. Malaysia, which until recently had been one of Pyongyang's closest friends, has halted all imports from North Korea, as part of global efforts to cut off funding over its nuclear and missile programs. In 2009, a pop video from North Korea celebrated a new national hero - one that outside experts would later realize was at the heart of the secretive state's banned nuclear and missile programs. A small earthquake rattled the area near North Korea's nuclear testing field but it did not appear to be manmade, South Korea's weather agency said on Friday, the latest to be observed after the North conducted its sixth and biggest nuclear test in early September. The United Arab Emirates is ending the mission of North Korea's non-resident ambassador and terminating its own envoy's services in Pyongyang, its Foreign Ministry said in a statement on Thursday carried by state news agency WAM. White House Chief of Staff John Kelly said on Thursday the Trump administration thinks the threat posed by North Korea's nuclear weapons capability is currently manageable but Pyongyang cannot be allowed to develop the ability to strike the U.S. homeland. Four suspects charged with two women accused of killing the estranged half-brother of North Korea's leader were identified for the first time in a Malaysian court on Thursday. U.S. President Donald Trump on Wednesday appeared to confirm he had North Korea in mind last week when he described a gathering of military leaders as "the calm before the storm." U.S. President Donald Trump has "lit the wick of war" with North Korea and his country will be made to pay with "a hail of fire", a Russian news agency quoted North Korea's foreign minister as saying on Wednesday. China's Foreign Ministry on Wednesday urged all sides to exercise restraint over the North Korea issue after the U.S. military flew two Air Force B-1B Lancer bombers over the Korean peninsula in a show of force. New Zealand aircraft manufacturer Pacific Aerospace Ltd has plead guilty in a New Zealand court to indirectly exporting aircraft parts to North Korea, according to Fairfax Media. A group of South Korean businessmen who own factories in the Kaesong industrial complex inside North Korea said on Wednesday they want to visit to verify the North's claim that it had restarted some operations there on its own. The United Nations Security Council has banned four ships from ports globally for carrying coal from North Korea, including one vessel that also had ammunition, but the United States postponed a bid to blacklist four others pending further investigation. U.S. President Donald Trump may travel to the heavily fortified demilitarized zone (DMZ) separating North and South Korea when he visits South Korea next month, the South's Yonhap news agency said on Tuesday, citing a defense source. A Vietnamese woman accused of killing the half-brother of North Korea's leader was captured on camera making an "aggressive" attack on him, two days after a similar act on another person, a police investigator told a Malaysian court on Tuesday. Kim Jong Un wants to turn this North Korean seaside resort into a billion-dollar tourist destination. He’s also launched nearly 40 missiles from there. Reuters reporter James Pearson has visited Wonsan, and describes North Korea's second city. Developments over the past year in North Korea have unquestionably been alarming. The secretive socialist country – the only one in the world whose rulers have handed down power from father to son – has demonstrated increasingly powerful military capabilities that reach far beyond its borders. And as Donald Trump and Kim Jong Un have traded escalating insults and threats in recent months, the situation has become more volatile than ever. Read 'A note about our North Korean coverage', by Stephen J. Adler, Editor-in-Chief. To kick off the dedicated section for in-depth, multimedia North Korea coverage, view the interactive guide to a city with a special place in Kim Jong Un’s heart – and his strategy for survival. In the seaside city of Wonsan, families cook up barbecues on the beach and go fishing. 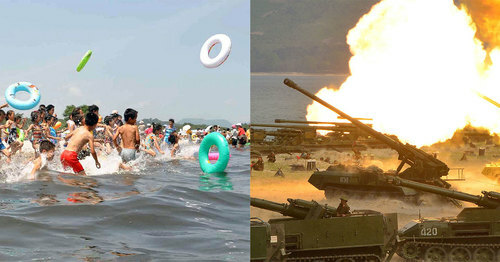 For Kim Jong Un, the resort is a good place to test missiles. Read the special report. North Korea's leadership has told Russian lawmakers that it possesses a ballistic missile with a range of 3,000 kilometers (1864.11 miles) that will be able to reach U.S. territory after modernization, the Interfax news agency reported on Tuesday. Interfax cited Anton Morozov, a lawmaker and member of the lower house of parliament's international affairs committee, who visited Pyongyang from October 2-6. North Korea aims to increase the range of its ballistic missiles to 9,000 kilometers (5592.34 miles), Morozov was quoted as saying. "There was no talk about the deadline (for solving this task)," he said. 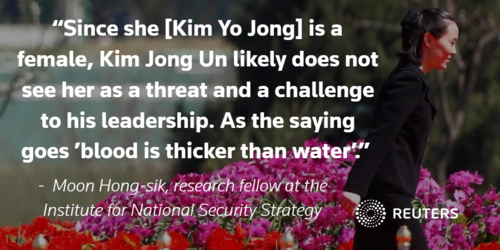 The promotion of North Korean leader Kim Jong Un's 28-year-old sister to the country's top decision-making body is a sign he is strengthening his position by drawing his most important people closer to the center of power, experts and officials say. U.S. President Donald Trump on Saturday said "only one thing will work" in dealing with North Korea after previous administrations had talked to Pyongyang without results. North Korea is preparing to test a long-range missile which it believes can reach the west coast of the United States, a Russian lawmaker just returned from a visit to Pyongyang was quoted as saying. Anton Morozov, a member of the Russian lower house of parliament’s international affairs committee, and two other Russian lawmakers visited Pyongyang on Oct. 2-6, Russia’s RIA news agency reported. “They are preparing for new tests of a long-range missile. They even gave us mathematical calculations that they believe prove that their missile can hit the west coast of the United States,” RIA quoted Morozov as saying. Russia is quietly boosting economic support for North Korea to try to stymie any U.S.-led push to oust Kim Jong Un as Moscow fears his fall would sap its regional clout and allow U.S. troops to deploy on Russia's eastern border. Weightlifting: Doping bans leave North Koreans set for glory in U.S.
Weightlifting's new hardline approach to doping has not only led to one-year bans for China, Russia and seven other nations, it has also opened the way for North Korea to register its biggestsporting triumph in U.S. President Donald Trump’s backyard. U.S. President Donald Trump and Japanese Prime Minister Shinzo Abe agreed in a telephone conversation on Wednesday that pressure should be maintained on North Korea, a senior Japanese government official told reporters. Seated beneath tall windows and dressed simply in singlets and trousers, North Korean painters are hard at work. The artists staple canvases to frames or copy idyllic landscapes from laptop computers. One wears headphones as he brushes a group of running horses onto his canvas. A United Nations human rights panel said on Wednesday it had credible allegations that North Korean authorities had tortured or mistreated children forced to return from abroad or held in detention. President Vladimir Putin said on Wednesday that U.S. President Donald Trump was listening to Russia's views on the North Korean missile crisis which emphasize diplomacy over further sanctions or military action. U.S. Defense Secretary Jim Mattis on Tuesday played down an apparent split between the U.S. president and his top diplomat over outreach to North Korea, saying America's focus was still on finding a diplomatic solution to the dispute with Pyongyang. While European powers France and Britain are lobbying Washington to cool tensions since North Korea's most powerful nuclear test a month ago, EU nations with embassies in Pyongyang are directly pressing the North Koreans. Lawyers for two women accused of murdering the estranged half-brother of North Korean leader Kim Jong Un said on Tuesday low enzyme levels in his blood may have been caused by liver disease or hormone pills rather than a lethal nerve agent. The White House on Monday ruled out talks with North Korea except to discuss the fate of Americans held there, again appearing to rebuke Secretary of State Rex Tillerson who said Washington was directly communicating with Pyongyang on its nuclear and missile programs. When more than a dozen North Korean economic officials visited California and New York in 2011, U.S. organizers hoped the tour would give the delegation ideas for market reforms and business innovations. North Korea has opened a second internet connection with the outside world, this time via Russia, a move which cyber security experts said could give Pyongyang greater capability to conduct cyber attacks. The Trump administration will not hold any talks with North Korea at this time, except for possible conversations about freeing U.S. citizens who have been detained there, the White House said on Monday. North Korean workers have begun to leave the Chinese border city of Dandong, following the latest round of sanctions seeking to restrict Pyongyang's ability to earn foreign currency income, local businesses and traders say. Russian telecommunications firm TransTeleCom appears to have begun providing a new internet connection to North Korea, supplementing an already existing link from China, 38 North reported on Sunday. Two women accused of assassinating the estranged half-brother of North Korean leader Kim Jong Un with a banned nerve agent pleaded not guilty at the start of a high-profile murder trial in a Malaysian court on Monday. U.S. President Donald Trump on Sunday dismissed the prospect of talks with North Korea as a waste of time a day after his own secretary of state said the United States was maintaining open lines of communication with North Korean leader Kim Jong Un.